Would you wear bugs as accessories? Molten silver and, on occasion, liquid gold take the shape of arthropods and reptiles in designer Helena Alegre’s distinct brand of wearable art. Seen in various states of arrest on the polished surfaces of semi-precious stones are beetles, dragonflies, lizards, wasps, and geckos, among other creatures that buzz, flutter, and crawl. To make her jewelry, Alegre studies the anatomy of insects and reptiles. She even works on intricate pen-and-ink illustrations of the critters. Alegre’s choice of subject is perhaps what makes her sculptural jewelry striking. 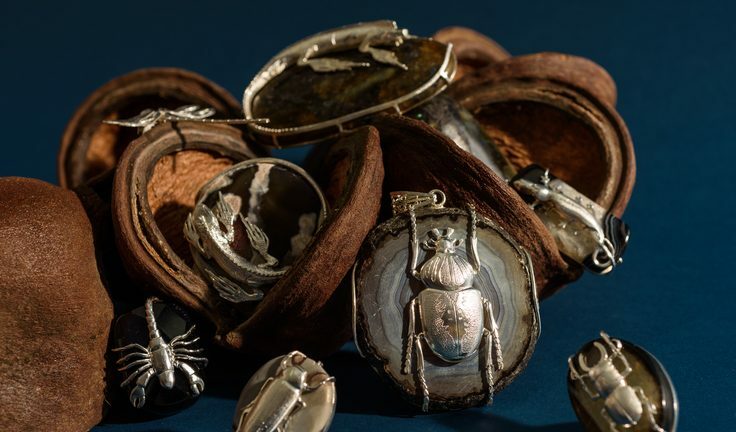 With the hands of a seasoned silversmith and the heart of a frustrated entomologist, she turns into magical representations of the animal kingdom what may otherwise be deemed as unsightly or odd. “I love beetles more than any other insect. In ancient history, they represented new life, rebirth, and reincarnation,” explained Alegre, who recounts fond memories of catching salagubang as a child. Like a true coleopterist, she cites the mighty Dynastes Hercules and Goliathus Goliatus as her favorites. There are no molds in Alegre’s sculptural craft, which is why no two pieces bear the same likeness. Alegre hammers, scrapes, chisels, and carves away in her workshop in Bicol until the precious metals take their final form, but they aren’t the only ones transformed in the process. Through her art, she also undergoes metamorphosis. “I took my time soul-searching and I eventually found myself in the province,” says the artist, who calls Camarines Norte home and explains that pagmumuni-muni or contemplation is essential to her process. She makes sure that 75 to 85 percent of her materials are sourced locally. Alegre also collaborates with the Department of Trade and Industry and employs Bicolano artisans, jewelry makers, and blacksmiths as a way of giving back to the community. The jewelry designer is also known for creating modern tambourine necklaces with intricate filigrees—Alegre’s personal take on cultural innovation as well as a fitting tribute to the heritage of Camarines Norte.